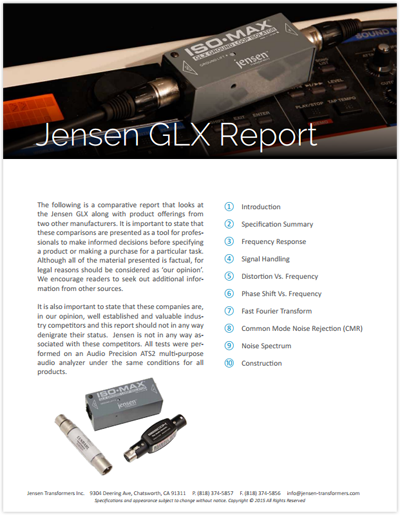 The following is a comparative report that looks at the Jensen GLX along with product offerings from two other manufacturers. It is important to state that these comparisons are presented as a tool for professionals to make informed decisions before specifying a product or making a purchase for a particular task. Although all of the material presented is factual, for legal reasons should be considered as ‘our opinion’. We encourage readers to seek out additional information from other sources. It is also important to state that these companies are, in our opinion, well established and valuable industry competitors and this report should not in any way denigrate their status. Jensen is not in any way associated with these competitors. All tests were performed on an Audio Precision ATS2 multi-purpose audio analyzer under the same conditions for all products.